Create customized dividers quickly and easily with these Big Tab Printable White Label Dividers. 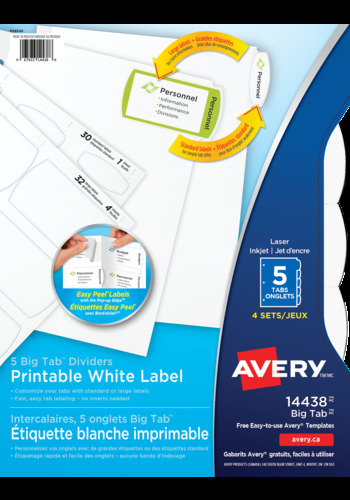 The arched-shaped tabs are simple to personalize using the free templates and designs at avery.ca. You can use standard-size labels for short descriptions, or larger labels when you need to include more information on your tabs (one sheet of each included). Create customized dividers quickly and easily with these Big Tab™ Printable White Label Dividers. The arched-shaped tabs are simple to personalize using the free templates and designs at avery.ca. You can use standard-size labels for short descriptions, or larger labels when you need to include more information on your tabs (one sheet of each included). Print your labels in black and white, or create a custom colour set using a laser or inkjet printer. The print-to-the-edge Easy Peel labels, featuring our Pop-up Edge®, make it fast and simple to personalize your tabs, with no inserts required. Simply bend back the label sheet, peel your label and apply to the divider tabs.